How do you know if your old fishing lures are worth anything? The first step in valuing these "mantiques" is to look for a brand such as Heddon, Pflueger or Creek Chub Bait Co. (also referenced as CCB Co. by collectors and dealers in the know) printed on the lure. Knowing who made lure you are investigating makes researching the value easier when doing online searches and poring over completed item results on eBay.com. 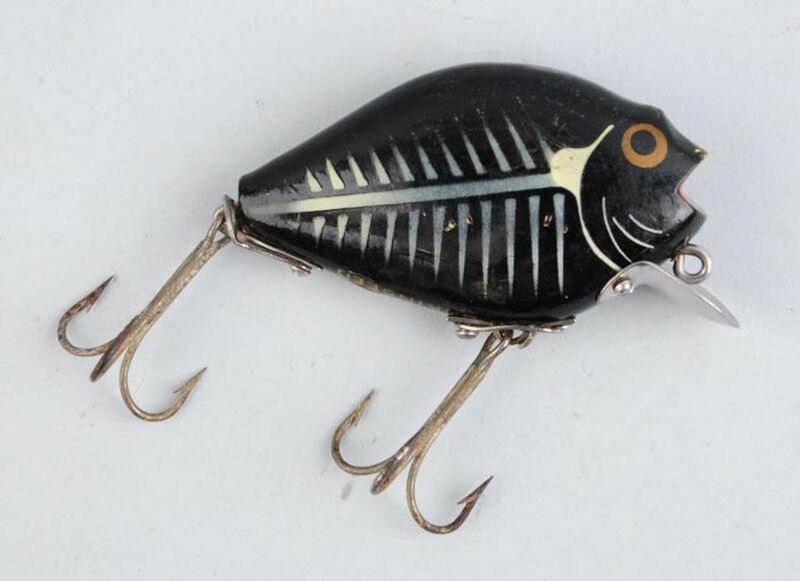 There are a host of smaller companies that made lures as well, and even homemade folk art lures. There is a demand for all these types, but some are more valuable than others. The most valuable lures are usually made of wood and have glass eyes. Some very rare examples can be worth in excess of $20,000, in fact. Most won't be nearly that valuable, however, and price out between $25 and several hundred apiece. The sampling of lures in the following list fall into the low to moderate price range and would be seen as beginner's lures in the eyes of an advanced collector. These are the types you will find most often at estate sales or poring through grandpa's old tackle box. This lure is marked (although the writing is partially obscured by the hardware) on the bottom "Heddon Floater Punkinseed." This example has a painted eye rather than a glass eye. Heddon made this style of lure in different models and a number of different colors. Each one must be evaluated individually when determining value since some Punkinseeds sell for $25 and others are worth several hundred dollars depending on how they are decorated. In spite of the fading to this black example and some signs of wear, it sold for $125 (not including buyer's premium) at Morphy Auctions in November of 2015. Also marked on the bottom, as most Heddon lures are, this one is known as the Vamp model. It was produced over a number of years in many different colorways. Like the Punkinseed lures, each different color must be evaluated individually taking condition into consideration as well as how the lure is decorated. A smaller version known as the Baby Vamp was also made. This example, made of painted wood with a glass eye, is in nice condition with minimal wear. It sold for $100 (not including buyer's premium) in a Morphy Auctions live webcast event in November of 2015. Creek Chub Bait Co. Deluxe Wagtail Lure. This lure made of wood with a glass eye is marked Creek Chub Bait Co. Garrett, Ind. on the metal lip. Sellers sometimes reference the brand as CCB Co. in their listings. This is the goldfish coloration, but it came in other colors as well and each version must be evaluated individually in terms of value. This is the plain tail model. It sold for $75 (not including buyer's premium) in a Morphy Auctions live webcast event in November of 2105. This Pflueger fishing lure is known as the Live Wire model. Pflueger lures sometimes have rhinestone eyes, like this one, in colors to coordinate with the body. This example sold for $75 (not including buyer's premium) during a Morphy Auctions live webcast sale in November of 2015. Shakespeare made a number of different variations of their minnow lures. This one has glass eyes, hand painted stripes, and five hooks. In spite of being somewhat rough and worn, this example sold for $125 (not including buyer's premium) during a Morphy Auctions live webcast sale in November of 2015. Macatawa Bait Co. Fishing Lure with Box. 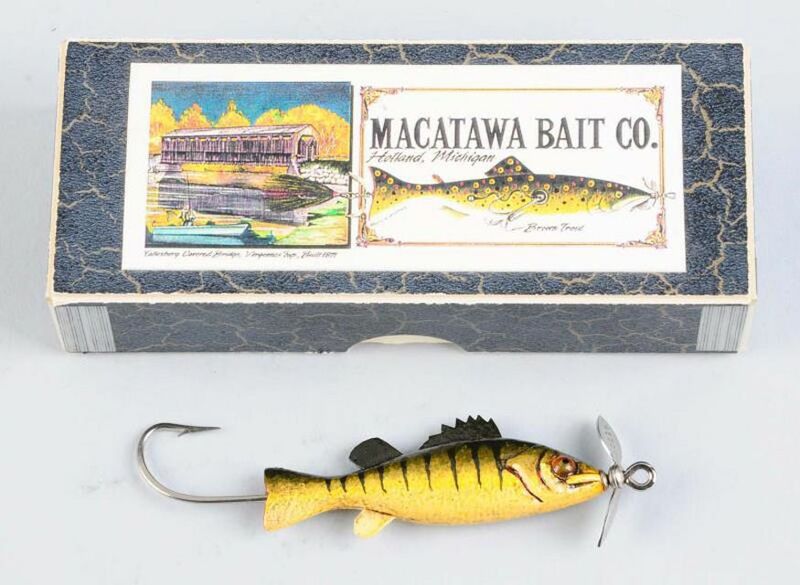 Not as well known as some of the other brands featured here, Macatawa Bait Co. lures are also seen as collectible along with other less prolific companies. The addition of an original box adds to the value of this auction lot. The minnow lure shown here has a single hook in excellent condition, one propeller and a glass eye. It sold for $75 (not including buyer's premium) during a Morphy Auctions live webcast sale in November of 2015.